The 2017 Suffolk Park Hop is underway, and lasts all summer long! 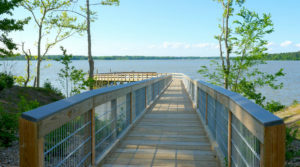 This summer, get outside and enjoy the beautiful parks all around Suffolk, Virginia. Take part in a five-park scavenger hunt for a chance to win some awesome prizes. It’s easy, it’s free, and it’s fun! Taking part of the Park Hop is easy. Just pick up a Park Hop Passport (available at libraries, the Visitor’s Center, and attractions all over Suffolk – PLUS they are at all five of the parks involved in the Park Hop). Once you you have your passport, it’s time to visit the parks! At each park, there is a Park Hop sign (just look for Peanut the Frog) and each sign has a clue for you to write in your passport. Once you have all your clues, email your answers to info@healthysuffolkva.org and you’ll be entered into a drawing to win one of our prizes. The park hop can also be enjoyed by even the smallest of tadpoles, on each clue sign there is a tadpole color, just match the color to the one in the passport. But that’s not your only way to win! Take a picture of yourself, your family, or a friend and tag the image on Facebook, Twitter or Instagram with #SuffolkParkHop to be entered into a separate drawing for prizes.